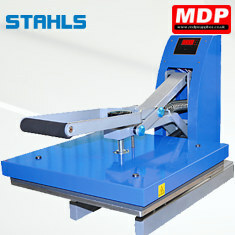 The Stahls Clam range of heat presses give professional performance at a low price. Available in 3 different types, the Stahls range of flat platen and cap heat presses feature a digital display allowing you to accurately control the temperature and time settings. The digital LED display showing time left and the set timing. The digital LED display shows the actual temperature and the required temperature. The presses surpass EU safety standards and come with CE and RoHS certification. 1 Year RTB warranty. Available in 2 platen sizes.